Tenkar's Tavern: The Ennie Nominations Have Been Announced - Should You Care? 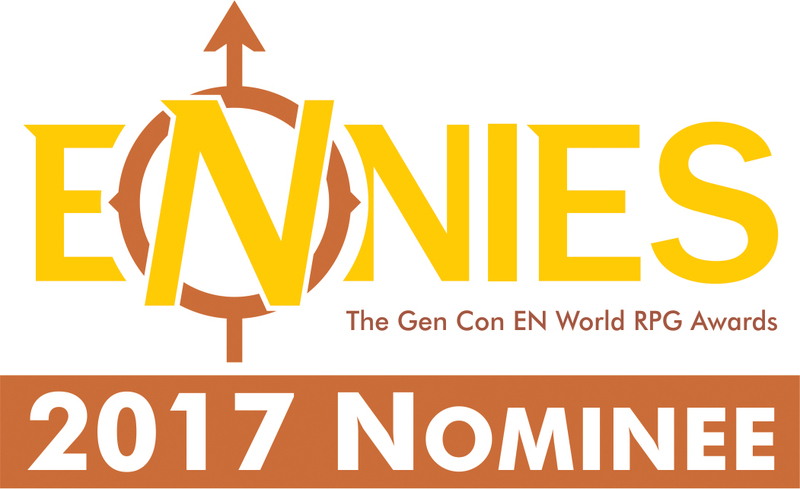 The Ennie Nominations Have Been Announced - Should You Care? So, the Ennie nominations have been announced - should you care? 1 - WotC got ZERO nominations. They did get a "Judge's Spotlight" for Tales of the Yawning Portal but no actual nominations. 2 - Paizo got ONE nomination - for its "pawns" (miniatures) - no nominations for actual gaming content. 3 - LotFP got SIX nominations - Veins of the Earth got four of them. They also snagged a "Judge's Spotlight". 4 - Only one of the five nominated blogs comes close to The Tavern's traffic - Gnome Stew. Actually, that's a well deserved nomination. Keep an eye on Noble Knight, Erik. I got my copy of Veins of the Earth from there for $49 during a sale. ENnies are self-nomination, so if SWL isn't on there, that's not on the ENnies. Wonder if WotC even participated. The Frogs submitted SWL (a free in print ruleset) and Bard's Gate. The only reason LotFP gets so many nominations is the publisher has the money to nominate all of his stuff. ha ha ha ha ha HA *wheeeze* hahahahahahahahah! They are a joke.. you have to self nominate, and send 3 copies of your games to the so called judges. It's the joke of the gaming world, it means nothing. (Keep in mind they call themselves the biggest awards in the gaming world) who cares..
After last years fiasco, I'm shocked Gen Con even let's them do this shame of a awards show. Zounds! What was last year's fiasco, may I ask? Oh sorry 2 years ago all ready.. wow.. Time.. Where does it go... .. was 2015. The so called "judges" at the ENnies awards managed to not once, not twice but three times nominate Mass Effect: The Fate RPG. It is up for Best Electronic Book, Best Free Product and Product of The Year. This PDF game had previously appeared at the DriveThruRPG site, where it was taken down for copyright and trademark infringement. TLDR - They nominated a game that was not authorized and was a copyright infringement. Plus people were walking out of the "Awards Show" as it was just a mess and not well thought out or produced. Nobody walked out of the awards show last year. I know, I was there--collecting my awards. Some prudes walked out when Red & Pleasant Land won in 2015, but that's a good thing. I think last year's fiasco was a Fallout RPG, "won" but had zero licensing permission. Correct me if I'm wrong please. You're wrong. No such game was nominated for, nor won an Ennie last year. Or any year, as it turns out. The Mass Effect thing mentioned above did happen a couple of years ago, but was removed from nomination before voting took place. Aye, but it was nominated. What a fiasco. "After a day of comments about the fan-made unlicensed Mass Effect RPG being nominated for multiple ENnie awards, Russ “Morrus ” Morrissey of ENWorld, stated that the game would be removed from the slate of nominees. The Mass Effect RPG, nominated for Best Electronic Book, Best Free Product, and Product of the Year, was written and designed by RPG industry veteran Don Mappin. The game is based on Galileo Games’ Bulldogs!, a Fate Core-based game." “I am very public and open that it is an unlicensed product, made available free of charge and that no renumeration is to be made from its distribution. The Fate core OGL is adhered to (to the best of my ability) as well as content from Brennan Taylor of Galileo Games and their Bulldogs! product, with permission,” Don Mappin responded. “I don’t believe that I have violated any aspect of the rules for the ENnies and would hope that my work could be considered." Yep. It was a pretty major misstep. That said, the Ennies are more together than the Hugo Awards have been for a couple of years now, so that's something. Yes, yes, we know you hate Fred Hicks. Or self-absorbed sociopaths waging one-man harassment campaigns against anybody who has ever hurt his feelings online, right? James it sounds like you're trying to start a fight with a stranger online. Come on Guys! No name calling. Zak, you are a public figure. You certainly aren't a stranger. Meh. after 2015, the awards just seem worthless now. I'm more interested in seeing how Eric Noah is doing. S. Petersen’s Field Guide to Lovecraftian Horrors (Chaosium) was great in 1988 when it first came out. Is the new version substantially different? The ENnies are NOT self-nominated. Publishers submit products to a panel of judges who evaluate them before nominating. Voting is a public vote. A quick look at the rules at www.ennie-awards.com disproves the whole "self-nomination" misconception, as will comparing all the submissions against the list of nominations. It is not "the best of the best that was published" - its "the best of the submissions we received"
There is a huge distinction between the two. What is your alternate solution, then? Require all judges or a volunteer organization with no income to purchase every RPG product published in a given year? I hear a lot of people criticize, but no one offers alternative solutions with their criticisms. We're not a massive corporation like Consumer Reports (and even they don't buy a sample of every product release for every category for which they do evaluations). Plus, participation is not mandatory. If a publisher doesn't want to participate, they don't have to. I don't know of any major industry awards that rounds up each and every product released in a particular period of eligibility for whatever they're giving awards for; it's all submission from companies who are interested in participating. My first suggestion? Require products that are available in PDF to be submitted ONLY in PDF. For one, it lowers the cost of entry. Shipping and mailing multiple packages worldwide is cost prohibitive for many publishers. Additionally, it kills less trees for books the judges aren't going to keep in any case. How many times have we heard stories of ENnies judges selling off the prior submissions on eBay and the like. I don't blame them either, as who can store hundreds of books for games they don't play? Besides, being an ENnies judge shouldn't be about the "fat loot" one gets to sell later but the integrity of the judging process. Requiring the majority of submissions to be in PDF does away with most of these issues. Heck, you could ensure each judge's selection of products has a unique hidden watermark, so if something does leak into the pirate world we know who the guilty party is. Physical product is NOT a necessity for the judging process. It is a luxury. Seriously, how many thousands of dollars - tens of thousands - was spent shipping books to Poland and Turkey? How about after the award ceremony you release the vote tallies? Nothing brings a feeling of validity to a process more than full disclosure. I would like to see the vote tallies myself.